"This is a majestic and splendidly written tale of pride, passion, intrigue and deceit that is brought alive from the first page to the last." 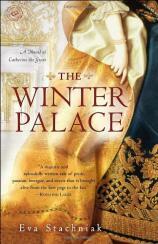 "Awash in period details and as gripping and suspenseful as any thriller, The Winter Palace gives us a unique look at the making of a queen. Eva Stachniak allows us to peep through keyholes and overhear whispers as we navigate the intrigues of Imperialist Russia along with Sophie, the princess who became Catherine the Great. I loved this book, and this glimpse into a world of silk and shadows, grandeur and gossip." "A wonderful tale of the Imperial Russia court in all its glittering glory. Eva Stachniak vividly brings to life the early years of the meek young bride who would become the terrifying fascinating Catherine the Great." "Covering the twenty years that turned Catherine the Great from a young bride on approval to the legendary Empress of Russia, Eva Stachniak’s novel gives a magical insight into the hopes and fears that haunted the corridors of the St. Petersburg palace. It brings alive the very tastes and textures of the mid-eighteenth century." "Utterly enchanting from the first page. Eva Stachniak brings to life the sensual feast that was Catherine the Great’s Russia in this beautifully written, tightly plotted novel." "This novel is literary sable to sink into on a cold winter’s night: luxurious and elegant, gilded with details, yet piercing in its depiction of the flamboyant decadence of the Russian court, and the tumultuous rise to power of Catherine the Great, as seen through the eyes of a scheming lady in waiting and spy. Once you enter the glorious, dangerous world of The Winter Palace, you will never want to leave." "The Winter Palace is an intensely written, intensely felt saga of the early years that shaped the 18th century’s famous czarina, Catherine the Great. Her survival in the treachery of the Russian court was an amazing feat, and Eva Stachniak captures the fluidity and steeliness that propelled Catherine from a lowly German duchess to one of the towering figures of the century." "Stachniak’s brilliant, bold historical novel of eighteenth-century Russia is a masterful account of one woman’s progress toward absolute monarchical rule….This superb biographical epic proves the Tudors don’t have a monopoly on marital scandal, royal intrigue, or feminine triumph." "Stachniak sets the scene extravagantly with details of sumptuous meals, elaborate wardrobes, and cunning palace politics. Longtime readers of English and French historical novels will delight in this relatively unsung dynasty and the familiar hallmarks of courtly intrigue."